Audi presents the latest iteration of its largest SUV. The second-generation Audi Q7 has arrived, bringing with it a more car-like look. At first glance, you may see a tall wagon as Audi lowered the hood and relaxed the roofline. Inch for inch, the dimensional changes are minimal for Audi’s largest SUV. The first-generation model lasted from 2007 to 2015; Audi skipped the 2016 model year. 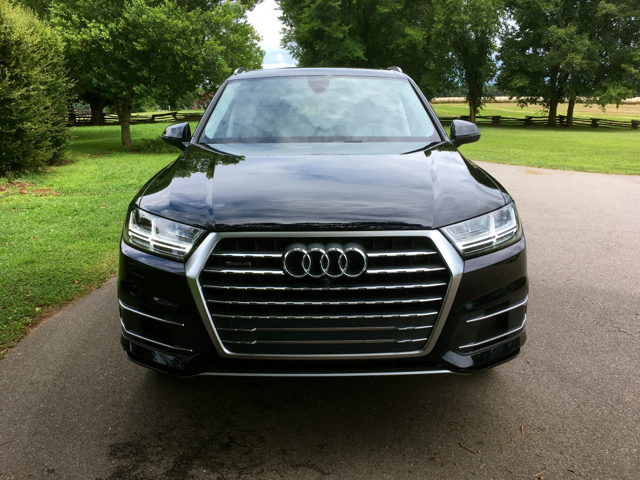 As before, the Audi 2017 Q7 comes in Premium ($49,000), Premium Plus ($53,000), and Prestige ($65,400) trims along with two gasoline engine choices: a 2.0-liter turbocharged four cylinder or a 3.0-liter supercharged V6. Both engines come paired with an eight-speed automatic transmission with manual shifting capabilities. Gone is the turbo-diesel, vanquished following the Volkswagen Group’s diesel debacle that uncovered emissions cheating followed by billions of dollars in fines and buybacks. For a while, Audi pushed to have the 3.0-liter turbo-diesel certified, but that now seems unlikely. My test model was the Premium Plus with the base engine. Opting for the V6 is a $6,500 upgrade for the first two trims, but this engine comes with the Prestige grade. Options included a vision package ($2,000) bringing in a virtual cockpit, full LED headlights, and a top view camera system. Also added were 19-inch five v-spoke aluminum wheels ($1,000), cold weather package — heated steering wheel and heated front seats ($500), rear side airbags ($350), and high gloss black and terra brown walnut wood inlays ($350). With a $950 destination charge, the final price came in at $58,725. All told, that’s about $20,000 less than the Land Rover Discovery I had a month earlier. Standard equipment includes Xenon plus headlights with LED daytime running lights, power adjustable and power-folding heated side mirrors, LED taillights, and rear fog lights. 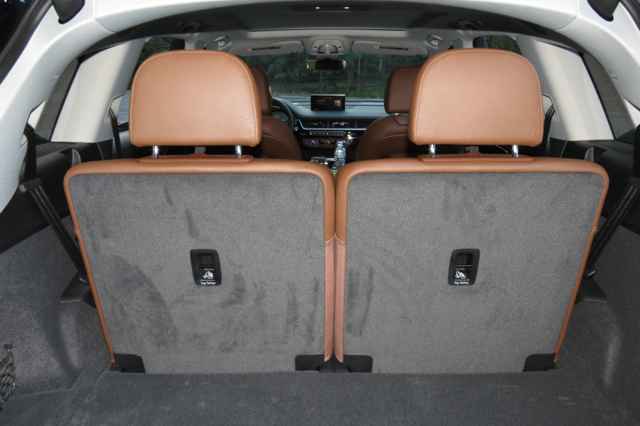 All models come with aluminum roof rails, a power tailgate, and rear privacy glass. 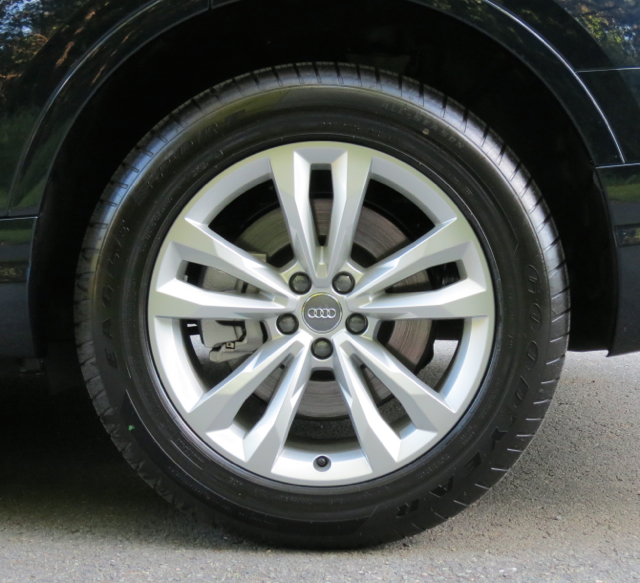 Audi offers a choice of three 18-inch wheel designs. 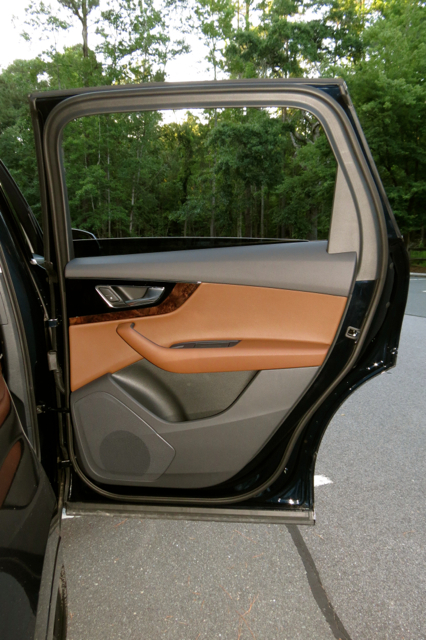 Package and trim-level upgrades raise the luxury and design quotient, adding such features as running boards, 20-inch wheels set within all-season run-flat tires, power soft-closing doors, and integrated twin-trapezoidal exhaust outlets. 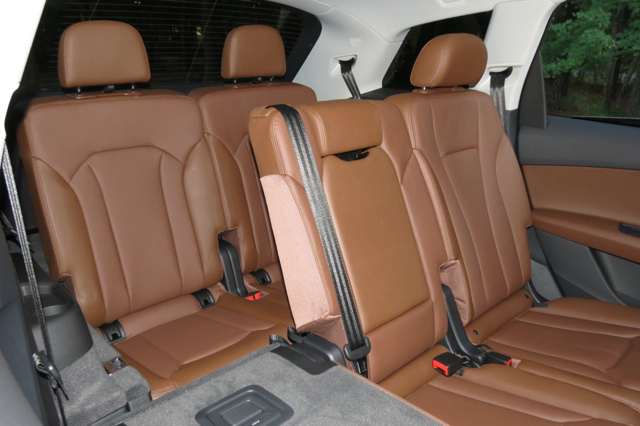 The Audi Q7 offers a 2+3+2 seating arrangement with ample room for the first two rows, but narrow space in the third row. The second-row seats move and tilt forward sufficiently, but that back row is best suited for two youngsters. 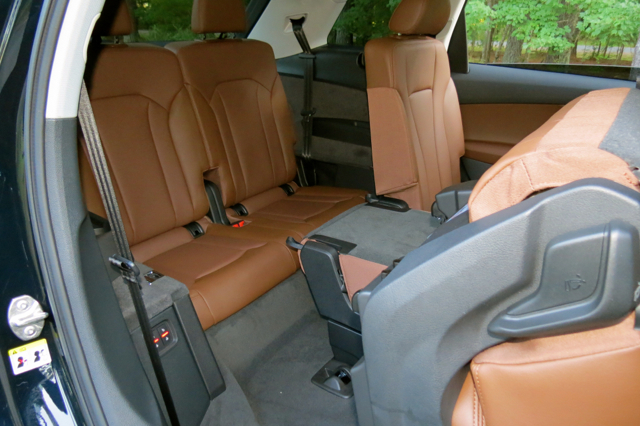 Most of the time you’ll want the third row seat, resting inside the floor to take advantage of the 37.5 cubic feet of storage space (14.8 cubic feet behind the third-row seat and 71.6 cubic feet behind the first row). 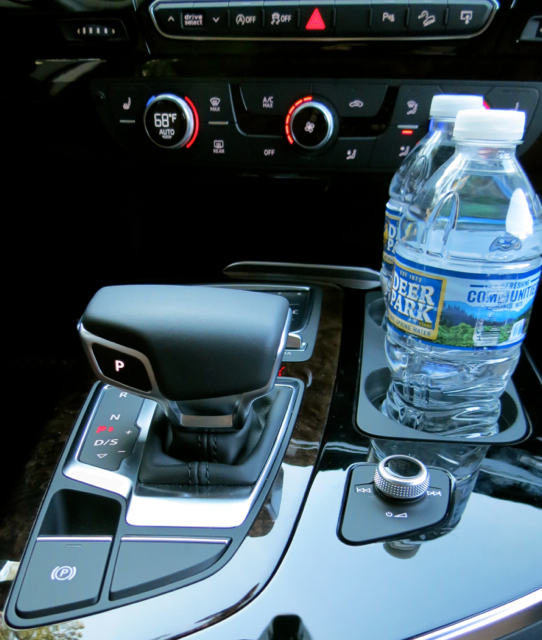 Audi interiors are beautiful — handsomely designed with high-end materials throughout. The workmanship is top notch — what’s especially evident is the careful attention to driver control placement and to the way the telematics system functions. Leather covers the seats, the door inlays, wraps the steering wheel and graces the top of the shift knob. 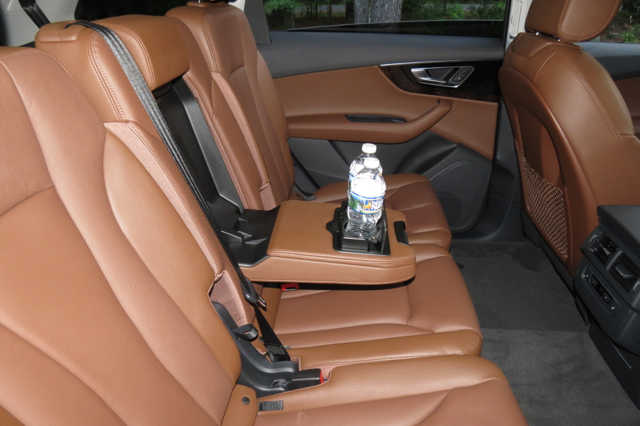 Standard equipment includes stainless steel door sill inlays, ambient LED lighting, a tilt and telescopic steering column, three-zone climate control, panoramic sunroof with a power sunshade, and 10 beverage holders. 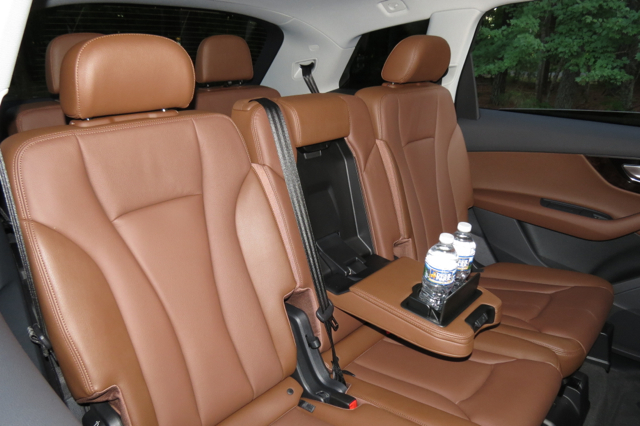 You’ll find very comfortable power front seats with heating elements. 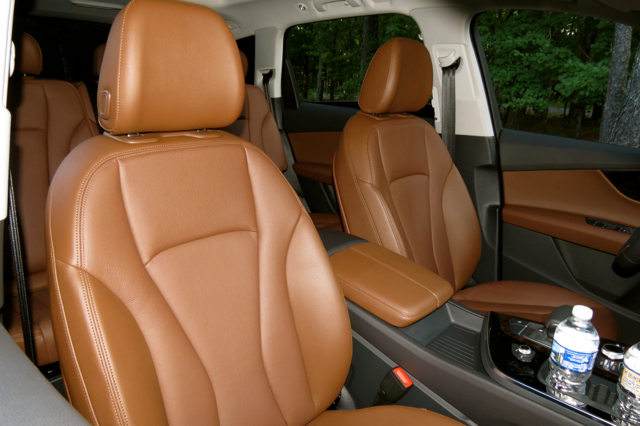 Upgrades swap out the cloth headliner with a Black Alcantara headliner, individually contoured front seats with ventilation, Valcona leather, four-zone climate control, a power-folding third-row seat, and extended LED ambient lighting. 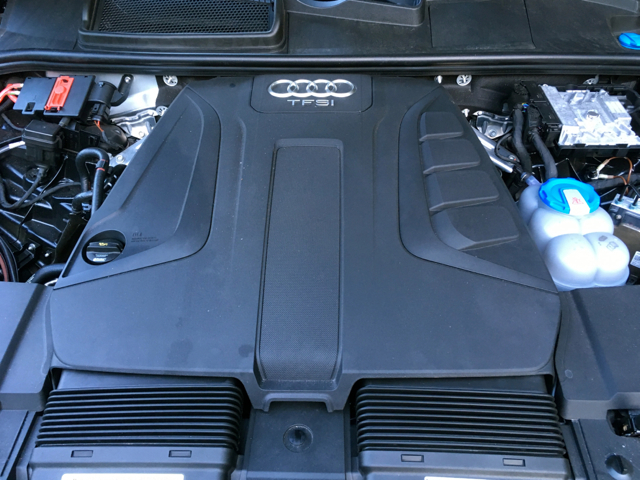 Audi provides a 2.0-liter, turbocharged four-cylinder engine making 252 horsepower and 273 foot-pounds of torque. And if that isn’t enough power, you can upgrade to a 3.0-liter supercharged V6 generating 333 horsepower and 325 pound-feet of torque. Both engines come paired with an eight-speed automatic transmission. My test model had the smaller engine and it quickly became apparent when I stepped on the gas pedal. This fairly sizable SUV pulls away from a dead stop with deliberation, cranking out more power once the turbo spools up. However, even when fully engaged the engine just didn’t seem to provide enough power to correspond with the size of the SUV. Had I driven with a full contingent of passengers, I might have found the experience lethargic. Manufacturers are putting smaller engines under the hood in an effort to boost fuel economy. Consequently, there is a corresponding decline in power even with forced induction. 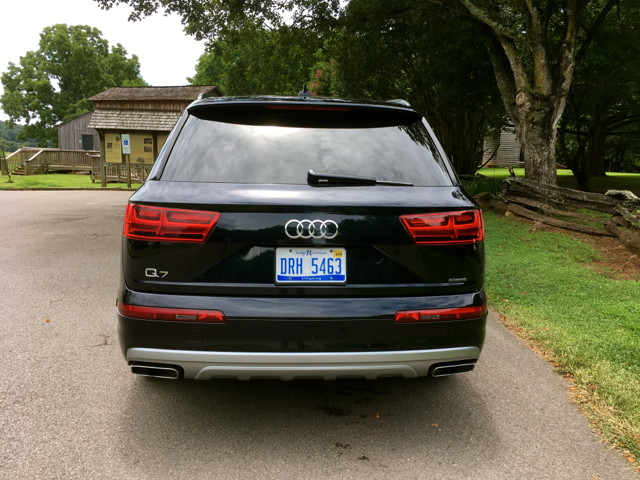 If considering the Audi Q7 as your family vehicle, pony up the extra bucks to get the supercharged V6. Comparatively, the larger engine distributes full power from the onset and in a far greater amount — 32 percent more than the junior engine. 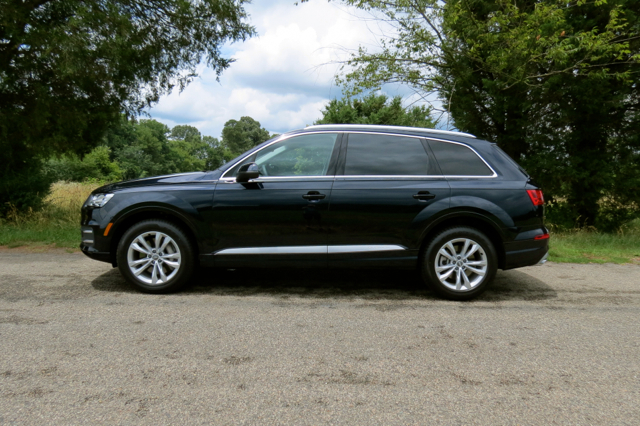 Although the base engine may fall short of expectations, nothing else about the Q7’s ride and drive disappoints. Indeed, all models come equipped with Audi’s prestigious Quattro all-wheel drive system, renowned for its strong handling attributes. 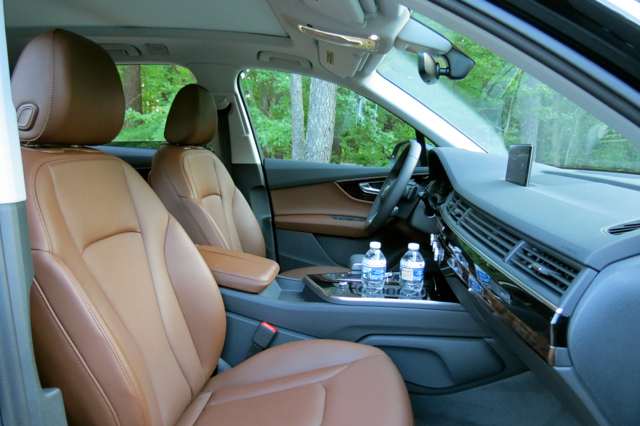 This SUV’s sight lines are quite good, the ride is comfortable, and steering is light to the touch. As always, you can dial in the level of feedback received through the MMI screen — comfort, auto, dynamic, and individual. Choose the mode based on your driving preferences — the suspension, transmission, and engine settings adjust accordingly. 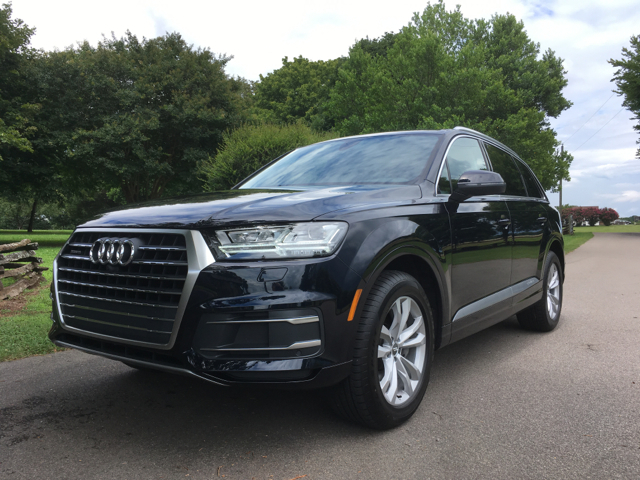 The 2017 Audi Q7 is an Insurance Institute for Highway Safety (IIHS) Top Safety Pick. This SUV excelled in all five crash testing criteria — small overlap front, moderate overlap front, side, roof strength, and head restraints & seats. 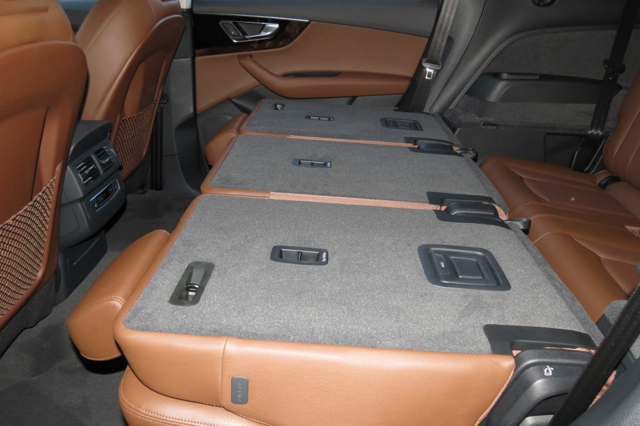 In front crash protection the Q7 garnered a superior score. The Q7 comes with the usual contingent of safety features, including a suite of airbags and brake assist. 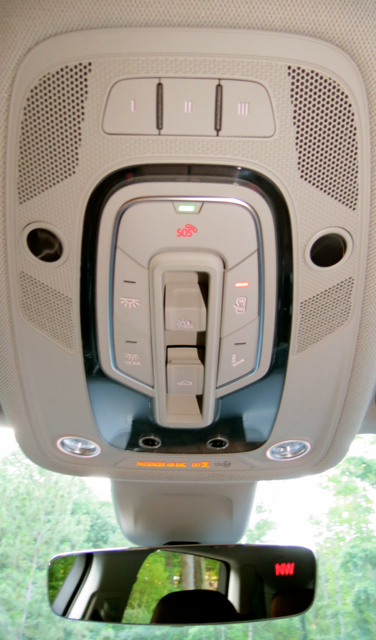 Overhead console in the Audi Q7. A driver assistance package ($2,400) brings in adaptive cruise control with traffic jam assist, lane keep assist, traffic sign recognition, and high beam assist. 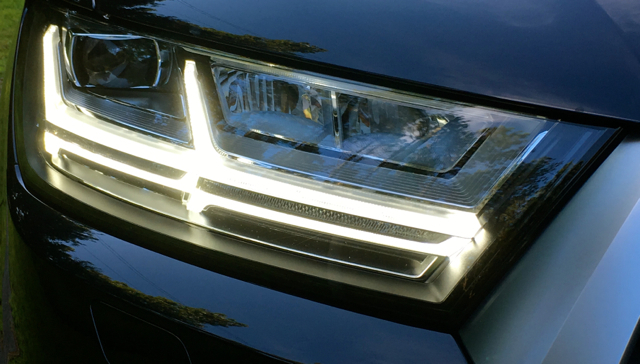 Audi is synonymous with technology and that’s evident across the model line. Driver-assist technologies are a big deal these days and Audi rises to the occasion. At speeds up to 52 mph, “Audi pre sense city” identifies cornering and stationary vehicles and pedestrians, and delivers full braking when a collision is certain. Available pre sense plus extends that limit to 137 mph and includes collision warning and emergency braking. Other available features include rear cross traffic alert, vehicle exit assist, turn assist, collision avoidance assist, stop and go and traffic jam assist, and adaptive cruise control. 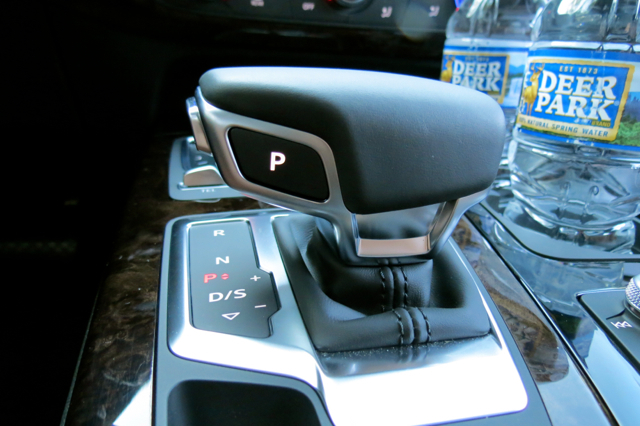 All models have Audi’s MMI scroll wheel feature, what controls the touchscreen. Available navigation, Audi Connect with 4G LTE internet, and a 10-speaker audio system with a CD player and MP playback are additional highlights. Buyers may upgrade to a 19-speaker Bose or to a Bang & Olufsen 3D advanced sound system ($5,000). I’m a fan of Audi’s telematics system. In the Q7, the screen emerges from the top of the dash and cants towards the driver. The black background with orange and white lettering is easy to read. The Google maps street view interface is quite detailed, revealing building outlines in addition to streets, parks, and other landmarks. 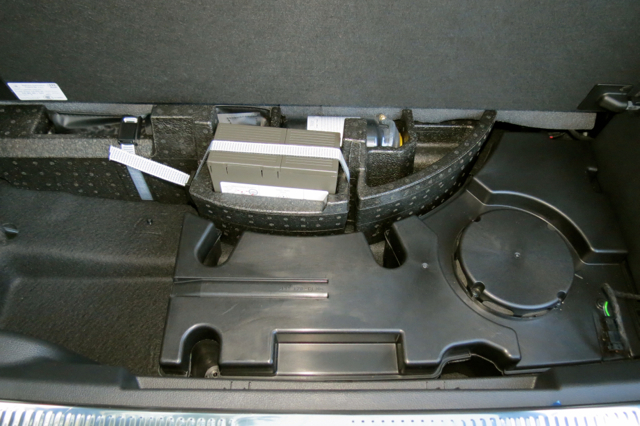 Audi also provides an “all-in-touch” multimedia interface co-developed with Preh. Instead of pressing a button for MMI functionality, sensors and actuators “read” your commands. Navigation, telephone and multimedia input control is at the ready in this unique hub. 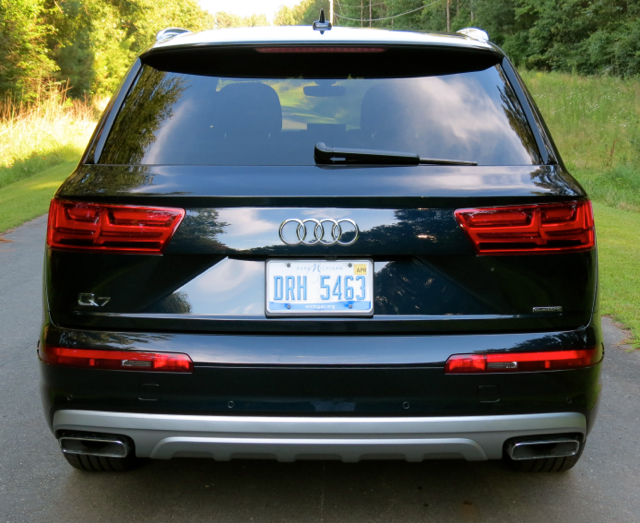 The all-new Q7 provides a more wagon-like departure from the previous SUV. Its bold face, elegant lines, and dramatic sculpting add flair and distinction, while its interior is as close to perfection for five passengers as anything else on the market. Yes, you can squeeze two youngsters in the third row, but that comes at much sacriffice to storage capacity. It is hard to say what the take rate will be on one engine versus the other, but if you put a premium on performance, only the supercharged V6 will suffice. Choose the Premium Plus with the V6 ($60,400) and include the driver assistance and vision packages and you’ll come away with a well-equipped model for about $66,000 — that’s easily within the range of other luxury models in this segment.